Is it safe for your dog to eat Chocolate? Read more to find out. Dog owners have always been warned about the dangers of feeding their pet chocolate. An innocent nibble of a chocolate chip cookie may seem harmless enough, but what about when a mischievous pooch decides to raid the Halloween candy stash or helps themselves to their owner’s chocolate birthday cake? What starts out as no big deal can quickly escalate into an eme rgency situation that requires immediate medical attention. Chocolate contains theobromine, a methylxanthine similar to caffeine, and is used medicinally as a vasodilator and heart stimulant. While small doses are not likely to cause harm, larger amounts can lead to vomiting, diarrhea, heart attacks, or even death. Although commonly thought that all chocolate is bad, it’s surprising to know that the darker and more bitter the chocolate, the higher the level of theobromine, and the more hazardous it is to pets. Baker’s and darker chocolates contain between 130-450 mg of theobromine per ounce, while milk chocolate contains about 44-58 mg/ounce, and white chocolate only 0.25 mg/ounce. That being said, it would only take one ounce of baker’s chocolate to potentially show signs of poisoning in a 50 lbs dog. Other foods to avoid include milk and nuts. As a general rule, sweets and fatty foods should be avoided as they can cause pancreatitis, but dairy products, such as ice cream, can be especially bothersome, causing diarrhea and other digestive issues. Adult dogs are deficient in lactase—an enzyme capable of hydrolyzing lactose into glucose—necessary for milk digestion. Nuts (almonds, walnuts, pistachios) can obstruct a dog’s throat or gastrointestinal tract. Almonds are not toxic, but are difficult to digest and can cause upset stomach, while macadamia nuts and moldy walnuts can lead to toxic poisonings. 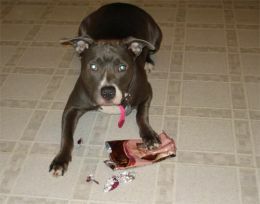 Dogs are forever forgiving, and won’t hold a grudge over withheld goodies. It’s tempting to offer these treats to an adorable, begging face, but knowing the risks it’s best to say no and avoid those complications and a costly trip to the vet. What do other dog owners have to say about whether their dogs can eat Chocolate or not? See comments below. Know if dogs can or can't eat Chocolate? Help other dog owners by leaving a comment.